BCIP Funding Awards $884k for Military Innovation | Mentor Works Ltd.
Lumiant Corporation, headquartered in Kelowna, British Columbia, is a market-driven materials science company working to discover, develop, and produce advanced materials for revolutionary products. The company is serving the transportation, defence, and industrial machinery markets, meeting the industries’ needs for products that require mobility, speed, durability, energy efficiency, and lightweight materials. Through a successful application to the Build in Canada Innovation Program (BCIP), Lumiant Corporation will receive up to $884,000 in a federal government contract. To optimize the new product’s commercialization phase, Lumiant Corporation applied and was successfully invited to participate in the Build in Canada Innovation Program (BCIP). BCIP is a first-procurement program offered through the federal government. It offers innovators a government contract to supply their product and allows for valuable feedback from the government department that tests/evaluates the product’s benefits over current products or processes. Lumiant Corporation has developed TitanMade® ballistic armour tiles; this product is meeting the demand for lightweight materials that withstand challenging application environments where weight and thickness are of critical importance. TitanMade® is a patent pending titanium aluminide composite material demonstrating favourable mechanical properties per unit mass as compared to other technical ceramics. The material’s properties allow armour to be thin, light, and durable in ballistic armour applications, improving the mobility and survivability of military vehicles. Through the Build in Canada Innovation Program, Lumiant Corporation will receive a $884k federal government contract for their defence technology, TitanMade® titanium ceramic composite material. As the product is not ready to enter the marketplace, Lumiant Corporation applied to the Build in Canada Innovation Program, which provides funding and end-user testing for pre-commercial goods to fuel the innovation’s development into a commercially sellable product. Defence Research and Development Canada (DRDC) has been chosen as a partner and will test the product in real-life settings. The Build in Canada Innovation Program is offered to businesses across the country to help them partner with federal government departments who can purchase and test their pre-commercial technologies. BCIP funding invests in Canadian companies with cutting-edge, innovative technologies to generate economic growth in communities across the country. BCIP funding supports technology projects with contracts up to $500,000 (standard innovations) or up to $1 million (military innovations). Standard Component: Provides Canadian government contracts for health technologies, environmental technologies, safety and security technologies, and enabling technologies. Military Component: Offers federal government contracts for command and support technologies, technologies that protect soldiers, training system technologies, in-service support technologies, and arctic and maritime security technologies. Typically, there is an open call for BCIP applications, meaning that innovators can submit their pre-commercial innovations for BCIP consideration at any time before the closing date. Please note, the call for proposals is currently closed due to a large volume of submissions. 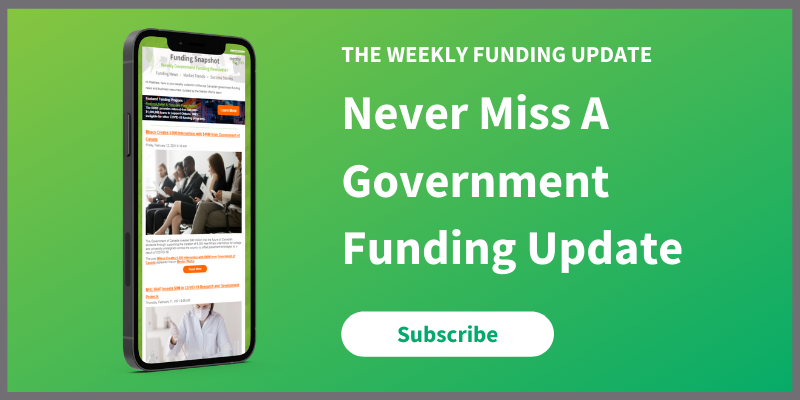 To be notified of the next Build in Canada Innovation Program Call for Proposals and to learn more about other government funding for innovation programs, register for Mentor Works’ Government Funding Snapshot Newsletter.